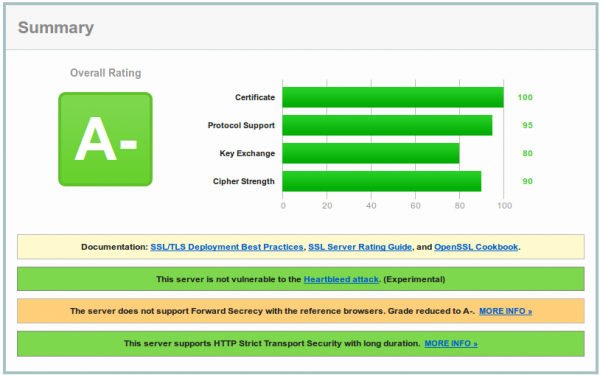 Robert Penz Blog » I get only a A- on Qualys SSL Labs tests – Why? and what can I do? I get only a A- on Qualys SSL Labs tests – Why? and what can I do? you’ll see that the problem is the Internet Explorer and that Forward Secrecy works for all other browsers. But what is (Perfect) Forward Secrecy in the first plage and why should you care. PFS ensures the integrity of a session key in the event that the private key of the server gets compromised. This is done by generating a separate session key for every new HTTPS session/connection. An attacker could record the SSL traffic for some time and later he got the private key and now without PFS he would be able to extract all the SSL traffic he was not able to look into before. Basically without PFS if a private key gets compromised you not only need to look the now and the future but also a the past and consider everything that was encrypted/signed by this key as compromised. With PFS you’re sure that an attacker is not able to extract data from before he got the private key. With the Heartbleed Bug in OpenSSL such an attack was possible or by hacking the server. The cipher suites (the ones you choose with SSLCipherSuite in the Apache configuration) that provide Perfect Forward Secrecy are those that use an ephemeral form of the Diffie-Hellman key exchange. The disadvantage of them is that they have a performance overhead, but the security is worth it and it is not that much overhead. With some elliptic curve variants the performance would be better. With Apache 2.2.x you have only DHE suites to work with, but they are not enough. Internet Explorer (in all versions) does not support the required DHE suites to achieve Forward Secrecy. (Unless youre using DSA keys, but no one does; that’s a long story.) Apache does not support configurable DH parameters in any version, but there are patches you could use if you can install from source. Even if openssl can provide ECDHE the apache 2.2 in debian stable does not support this mechanism. You need apache 2.4 to fully support forward secrecy. If you’re using RHEL 6.5 take a look at the Red Hat Software Collections 1.1 currently in beta, which provides Apache 2.4 – don’t know about CentOS at this point. Use Nginx as reverse proxy in front of the Apache because it fully supports ECDHE. Change to a web server that is shipped with your distribution and that does support ECDHE. I hope this post helped and saved you some time looking through the internet for a solution. Entries and comments feeds. Valid XHTML and CSS. 72 queries. 0.094 seconds.